1. Smallpox vaccination should be discontinued in every country except for investigators at special risk. 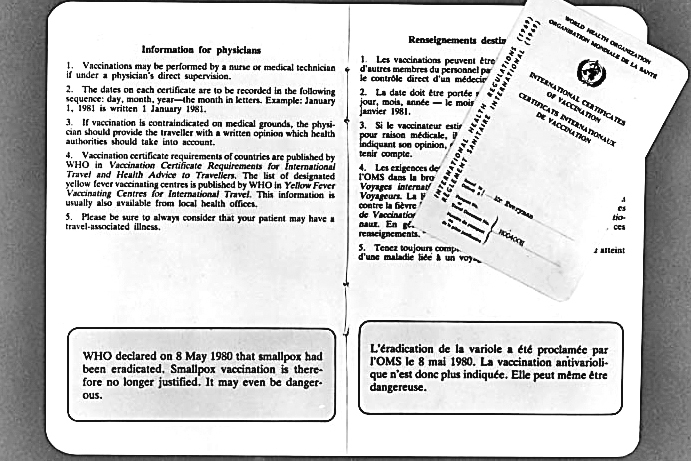 2. International smallpox vaccination certificates should no longer be required of any travellers. 3. Sufficient freeze-dried smallpox vaccine to vaccinate 200 million people should be maintained by WHO in refrigerated depots in two countries, together with stocks of bifurcated needles. 4. The stored vaccine should be periodically tested for potency. 5. Seed lots of vaccinia virus suitable for the preparation of smallpox vaccine should be maintained in designated WHO collaborating centres. 6. National health authorities that have vaccine stocks should be asked to inform WHO of the amount of vaccine maintained. 7. In order to maintain public confidence in the fact of global eradication, it is important that rumours of suspected smallpox, which can be expected to occur in many countries, should be thoroughly investigated. Information should be provided to WHO, if requested, so that it can be made available to the world community. 8. WHO should maintain an effective system to coordinate and participate in the investigation of suspected smallpox cases throughout the world. The international smallpox rumour register should be maintained. 9. No more than four WHO collaborating centres should be approved as suitable to hold and handle stocks of variola virus. A collaborating centre would be approved only if it had adequate containment facilities. Each such centre should report relevant information on their safety measures annually to WHO and be inspected periodically by WHO. 10. Other laboratories should be asked to destroy any stocks of variola virus that they hold, or transfer them to an approved WHO collaborating centre. 11. In collaboration with country health services, WHO should organize and assist a special surveillance programme on human monkeypox, its epidemiology, and its ecology in areas where it is known to have occurred. The programme should continue until 1985, when a further assessment of the situation the should be made. 12. WHO should continue to encourage and coordinate research on orthopoxviruses. 13. WHO should maintain the system of WHO collaborating centres for carrying out diagnostic work and research on orthopoxviruses. 14. 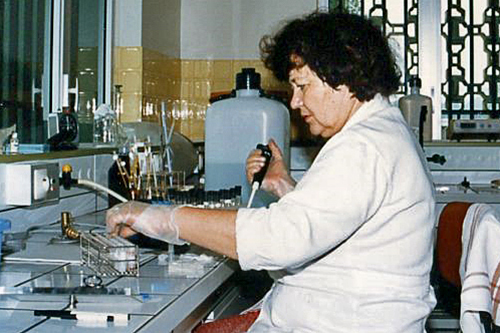 Research workers who do not work in a WHO collaborating centre and who wish to carry out experiments with variola or whitepox virus that are approved by the appropriate WHO committee should be offered the use of the special facilities in a WHO collaborating centre. 15. Research on poxviruses other than variola or whitepox viruses should not be performed under circumstances where there is any possibility of cross-contamination with these two agents. 16. WHO should ensure that appropriate publications are produced describing smallpox and its eradication and the principles and methods that are applicable to other programmes. 17. All relevant scientific, operational and administrative data should be catalogued and retained for archival purposes in WHO headquarters and perhaps also in several centres interested in the history of medicine. 18. An interregional team consisting of not less than two epidemiologists with past experience in the smallpox eradication campaign, plus supporting staff, should be maintained at WHO headquarters until at least the end of 1985. At least one additional field officer should be assigned to cover areas where human monkeypox is under investigation. 19. WHO should set up a committee on orthopoxvirus infections. 2001 Recent events and observations pertaining to smallpox virus destruction in 2002. Henderson DA, Fenner F. Clin Infect Dis 2001 33(7): 1057-1059.